Hip No. 677, a son of City Zip consigned by Summerfield (Francis & Barbara Vanlangendonck), Agent, was sold for $95,000 to Tracy Farmer to top the second and final Open session of the Ocala Breeders’ Sales Company’s 2018 October Yearling Sale. The dark bay or brown colt, out of Prettyatthetable, by Point Given, is a half brother to graded stakes winning OBS Yearling Sale graduate Pomeroy’s Pistol. Hip No. 648, a chestnut colt by Giant Surprise consigned by Kelli Mitchell, Agent, went to Bladen Bloodstock for $75,000. He’s out of stakes placed No Mo Magic, by Mo Mon, a half sister to stakes winner At the Disco. Hip No. 565, a daughter of Uncaptured also consigned by Summerfield, was sold to S G V Thoroughbreds LLC for $72,000. The bay filly is out of Jim’s Lonesa, by Put It Back, a half sister to stakes winner Who What Win. Summerfield also consigned Hip No. 603, a son of Kantharos purchased by W.D. North Thoroughbreds LLC for $72,000. The bay colt is out of Luca’s Lady, by Hold Me Back, a half sister to stakes placed Jet Majesty. Champion Equine LLC paid $72,000 for Hip No. 756, a son of Central Banker consigned by Beth Bayer, Agent. The bay colt is out of stakes placed Spirit of Rose, by City Zip. Hip No. 614, a chestnut colt by Kitten’s Joy consigned by Stuart Morris, Agent, went to de Meric Stables, Agent, for $70,000. He’s out of Mayakoba, by War Chant, a half sister to graded stakes winner Juniper Pass. For the session, 142 yearlings sold for a total of $1,845,400, averaging $12,996 with a $7,500 median figure. The buyback percentage was 25.6%. 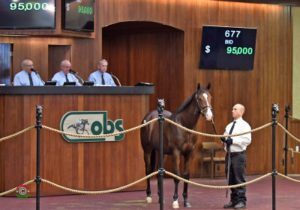 For the two Open sessions, 294 horses sold for a total of $3,870,250, compared with 291 horses selling for a total of $3,126,100 in a single session a year ago. The average was $13,164, up 22.5%, compared with $10,743 in 2017 while the median was rose to $7,000 compared to $5,000 last year. The buyback percentage was 24%; it was 23.4% in 2017. At Tuesday’s Selected session, 139 horses sold for a total of $5,698,000 compared with 115 yearlings bringing $4,959,400 at the 2017 Selected Sale. The average price was $40,993, compared with $43,125 last year, while the median was $28,000 compared with $30,000 last year. The buyback percentage was 25.3%; it was 33.9% a year ago. Nine horses sold for $100,000 or more compared with six a year ago. The sale topper was Hip No. 138, a son of Cairo Prince consigned by Stuart Morris, Agent, sold to John C. Oxley for an OBS Yearling Sale record $340,000. The gray or roan colt is out of Minutia, by Concord Point, a half sister to stakes winner Mykindasaint. The price bettered the previous mark of $335,000. The next item on the OBS agenda is the 2018 OBS Day of Racing, set for Tuesday, November 20. The next sale is the 2019 Winter Mixed Sale, including the Horses of Racing Age section, scheduled for Tuesday and Wednesday, January 29 – 30.